Given the clever retrograde chronograph movement, the Gran’Sport Chronograph is the pick of the Gran’Sport lineup today. It’s really too bad that gorgeous Reverso Chronographe Rétrograde is out of the price range for most people. Despite an amazing history of producing excellent watches and watch movements, Seiko never seems to get the respect it deserves. But perhaps the most curious attempt by Seiko to challenge the Swiss came in the form of the SARA watch and the 4L25 movement inside. My enthusiasm for various watch models tends to wax and wane as I see something interesting, and lately my attention has turned to the IWC Ingenieur range. From the original Milgauss competitor to Gerald Genta’s remarkable Ingenieur SL to the chunky Mercedes-AMG racing models, the Ingenieur lineup has always been worth a look. Yet today’s lineup is beyond bland and not deserving of the name. Good thing, too, since IWC seems to be eliminating that, too! Today’s “Watch A Day” is my Paul Picot Firshire chronograph, which I described extensively back in 2014. It’s combines a classic hand winding chronograph movement with modern build quality in a dressy yet sporty tonneau case. Four years on, I find myself wearing it about once a month, which is above average in my collection. The Storm Microcamera is something special only because it’s so darn odd. It’s not very functional or useful, but it looks cool and is excellently designed and made. It’s everything that “mushroom brands” like the Xeric aren’t. And I like it. Yesterday’s affordable Orient diver gives way today to an even better Swiss alternative: The Squale 1545 has heritage, provenance, classic looks, and serious Swiss construction. It’s the real deal, yet costs less than 1/10 as much as a Rolex Submariner. A few years ago, I was visiting lovely Como, Italy when I came across a very special watch. Alongside the usual selection of little old Rolex and Omega watches was a dark beauty: A Jaeger-LeCoultre AMVOX1 Limited Edition in titanium with a deep ruthenium dial. I brought that watch home and it’s become a favorite of mine. Now there’s a similar watch up for auction, and I suggest that you take a look! I love the mechanics of the IWC Da Vinci Perpetual Calendar watch, but it suffers from a serious issue for show-offs: The mechanism only works in one direction. 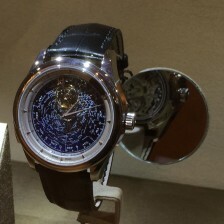 So now I give you the ultimate perpetual calendar: H. Moser & Cie.’s Endeavour Perpetual Calendar. It’s the cleanest, simplest, friendliest perpetual calendar watch on the market, and unbelievably gorgeous besides!